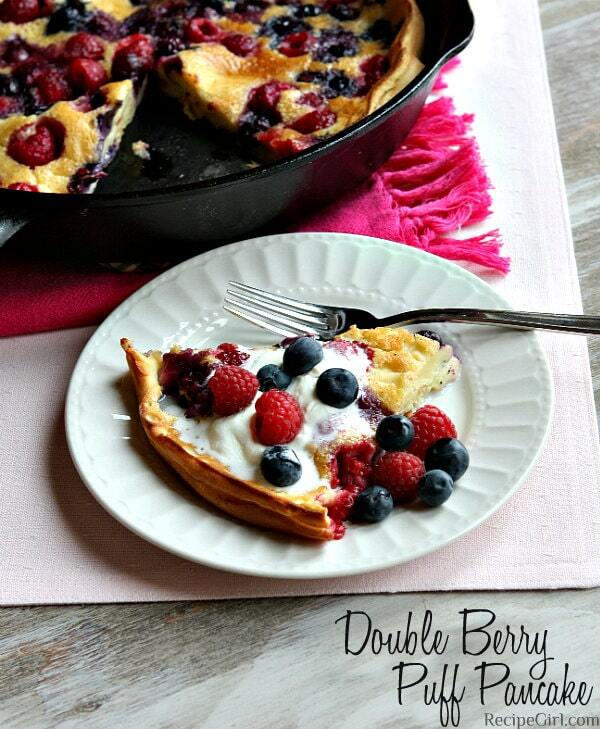 This Double Berry Puff Pancake is an easy recipe for a beautiful breakfast. 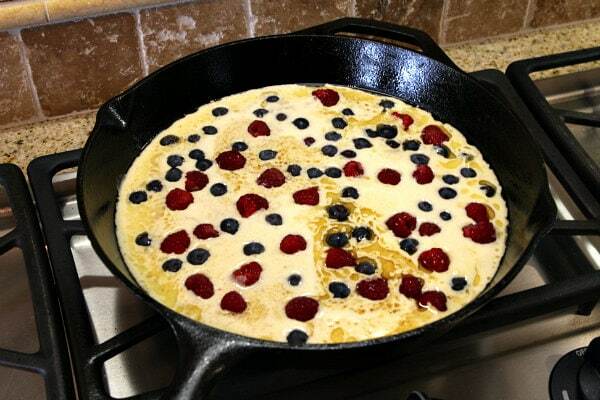 It’s one giant fluffy pancake cooked in a cast iron skillet with plenty of blueberries and raspberries. Watch the video showing you how to make this recipe, then scroll to the bottom of this post to print out the complete recipe so you can make it at home. Got red, white and blue on your mind yet? We’re starting to think ahead to 4th of July already. My son is most excited about lighting sparklers. They’re not allowed in California, but luckily we’ll be on the East coast for the big day so we can easily locate them! My husband is most excited for the food I’m going to make, and I’m most excited about utilizing berries to make some patriotic treats! 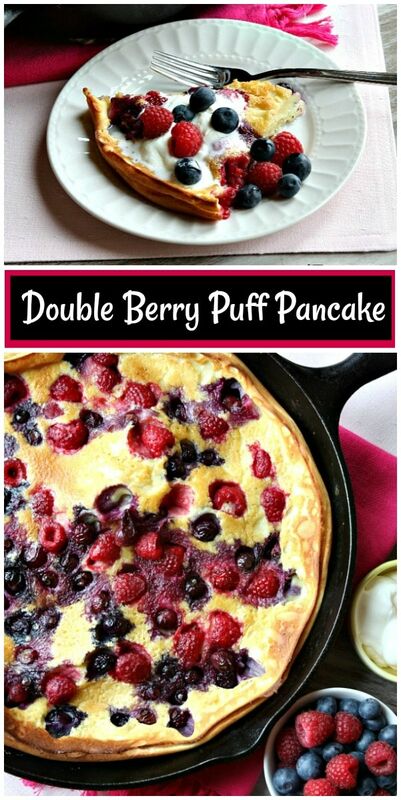 Let’s start with this Double Berry Puff Pancake. 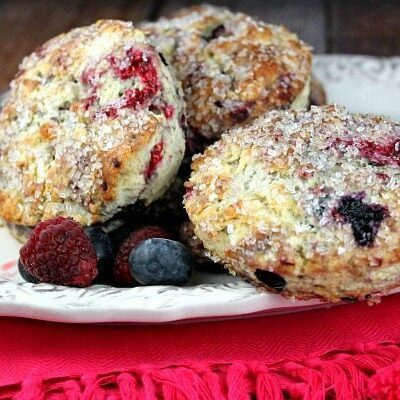 It’s definitely a fun summer breakfast treat if you find that you have access to some wonderful, fresh berries. The recipe begins in the blender. Use your blender (or a mixer) to combine the batter ingredients, and then pour it into a hot, oven-safe skillet. A cast-iron skillet works perfectly. 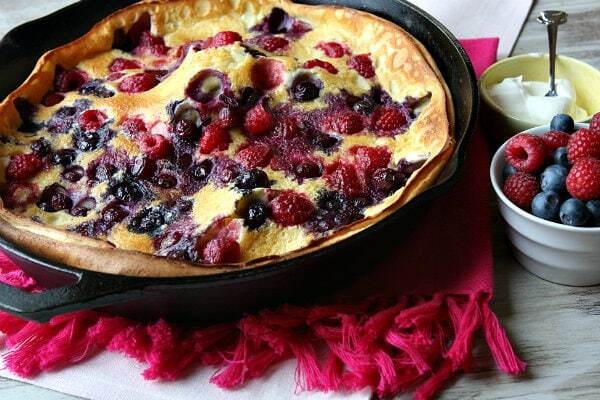 Scatter fresh berries on top. I like to use blueberries and raspberries. Move the skillet to the oven, and bake the pancake until it’s puffy and cooked through. It’ll get all wobbly looking like you see in the photo. Serve slices with fresh cream or a sprinkle of powdered sugar. My sweets-loving hubby drizzles maple syrup on top too. Enjoy this special treat. And may you twirl a sparkler or two in the coming weeks… just for fun. Cause when’s the last time you did that, right? If you’re looking for more puff pancake recipes, you might like to try my Apple Puff Pancake or this savory Ham and Spinach Puff Pancake. And if you’re looking for something special to make for a weekend breakfast for your family, I definitely recommend my Cinnamon Roll Pancakes or this Crescent Bacon Breakfast Ring. Everyone loves and appreciates a special surprise breakfast! 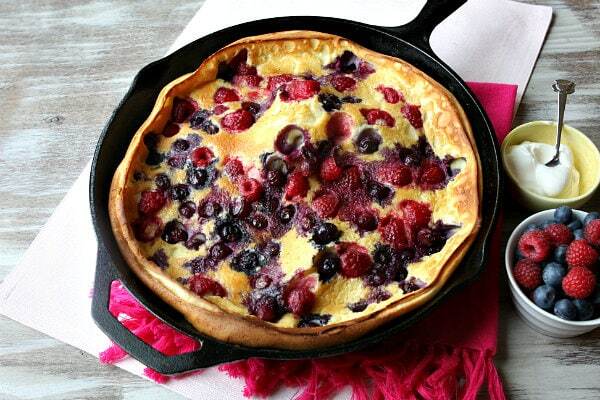 A delicious and airy cast iron skillet baked berry pancake. Use a blender or hand mixer to combine the eggs, milk, flour, sugar, lemon zest and salt. 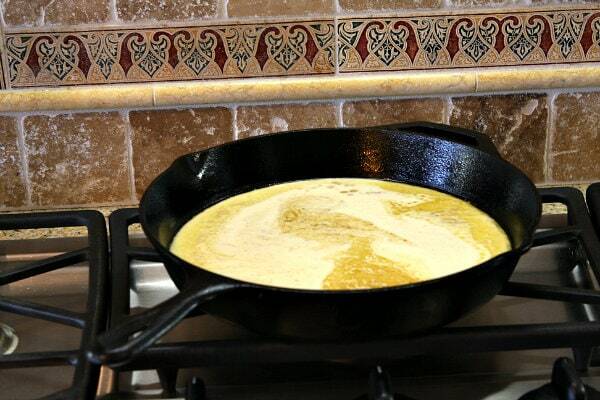 Heat a 12-inch cast iron skillet over high heat on the stove. Add the butter and melt. 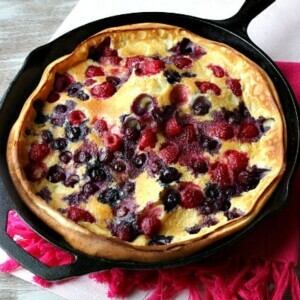 Pour the batter into the skillet, then scatter the berries on top. Put the pan in the oven, and bake until puffed and cooked through, about 20 minutes. Slice and serve, topped with powdered sugar, syrup and/or freshly whipped cream, as desired. This is a family favorite. But instead of baking it in a cast-iron skillet, we bake them in a 9×13 glass cake pan. I heat the pans and butter in the pre-heating oven while I prepare the batter. It works perfect, and the family loves when I make this recipe. Yummy! This was so tasty! I love puffed pancakes. I actually did a post on mini ones on my blog: https://www.bakesandblunders.com/try-new-pancake-mini-dutch-babies/. I love a fancy breakfast that’s easy to make. 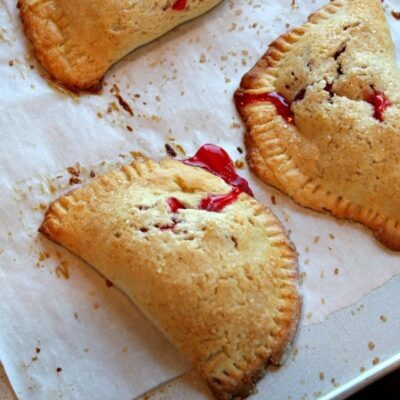 I would definitely make these again! -I also wanted to second All Natural Katie’s comment about burning the pancake – watch the skillet heat when melting the butter and move the skillet to the oven immediately! Love this, and beautiful display. I’ll be trying these pancakes in my own kitchen. I’ll probably drizzle some real maple syrup over them as well 🙂 Shared on my facebook page and linked to your blog. Thanks so much! 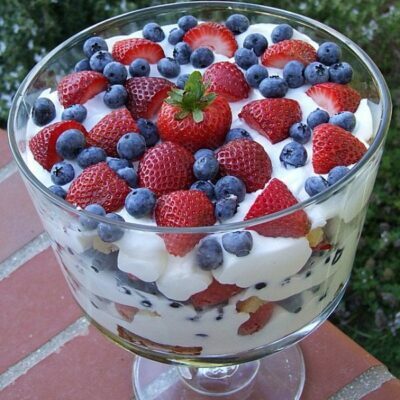 I really enjoyed this recipe, especially with the berries on top. The high heat might have been a bit too much for cast iron. I recommend immediately removing the baked pancake from the pan. Otherwise, the bottom will burn and the whole pancake will taste burned. Cast iron stayed hot for quite a while and continues cooking whatever food is in it. I will make this recipe again. Looks like a perfect Saturday morning breakfast! Easy and delish, good way to use some of the extra eggs my chickens are giving me! !!????? I love making this puff pancake for breakfast. I’ve made it several times already. I like to use apples in mine. Fun may to make pancakes for everyone at once. Just as a side note – sub almond milk and good gluten free flour mix for anyone that needs gluten and/or dairy free options. This is a great recipe! Quick,easy, & tasty. My 2 year old won’t touch eggs except these. The only thing I change is we use skim milk instead of whole milk cause that’s what we have on hand. We have made this many times and it always turns out great. Thanks for the great recipe. Just tried this—I didn’t have a cast iron skillet so I used my ceramic dutch oven. It ended up requiring an extra 15 minutes baking time, I suppose because the batter was denser—but oh boy was it amazing when it came out. It tasted just like my mom’s clafouti, maybe that’s another name for this? There was a sale on strawberries, so I tossed them in with the black berries and rasberries—what a treat during this cold february. 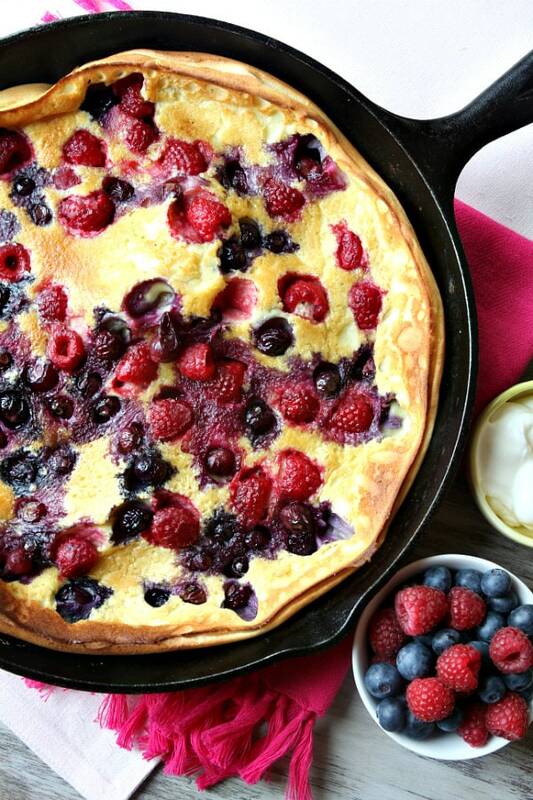 This is absolutely delicious I added another berry and made it triple berry puff pancake! I made these today (the one with just the blueberries) and it looked really beautiful like your picture but something just didn’t taste right. Two of my friends agreed. It seemed a little dense but maybe that is what “dutch” pancakes are. I used skim milk because I didn’t have whole milk and I don’t know if that would have made a difference. Anyway, want to do it again and thought maybe someone had some pointers. The milk definitely could have made a difference in the texture.